But then it turned out to be a banal gangster story, despite the fact that it’s about the legendary and famous John Dilinger. And this crime story is interwoven with a tale about his affaire with Billie Frechette (Marion Cotillard). What follows is a story that jumps all over the place with a few ridiculous scenes. Like the firefight in the woods where they were hiding. It’s a mystery to me there were still trees standing upstraiht afterwards. 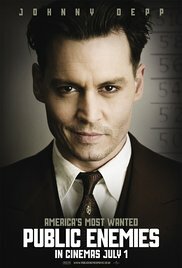 And for example John Dillinger, the most wanted gangster, who walks nervously along a street when his girlfriend is arrested. And not one of the dozens of agents standing there, recognizes him. Really nobody? In the end it’s not a movie as “Once Upon a Time in America” or “Goodfellas“. And certainly not “The Untouchables”. But it was a pleasant watch eventually !